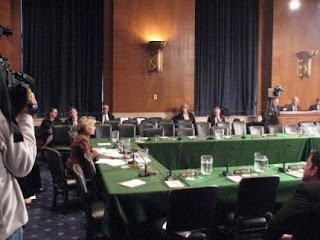 The photo is of Senator Barbara Boxer at a meeting of the Environment and Public Works (EPW) Committee, taken from above and behind. The caption under the photo is, “Sen. Barbara Boxer presides Thursday over the Environment and Public Works Committee on Capitol Hill as the panel pushed along an emissions bill, despite a GOP boycott.” The impression is that Senator Boxer is working hard as she chairs her committee. Which picture is contrived, and which reflects reality? One fosters an impression of a hardworking Senator. The other conveys an impression of a Senator posturing and wasting time. I think Michelle’s post might give a more accurate impression of the work being done in the EPW Committee. The Denver Post could have highlighted the divisive nature of the proceedings, but chose not to. It presents a picture of a dedicated Senate leader, working to cure world climate problems. It gives one a sense of “The Narrative” in our anti-Republican culture.